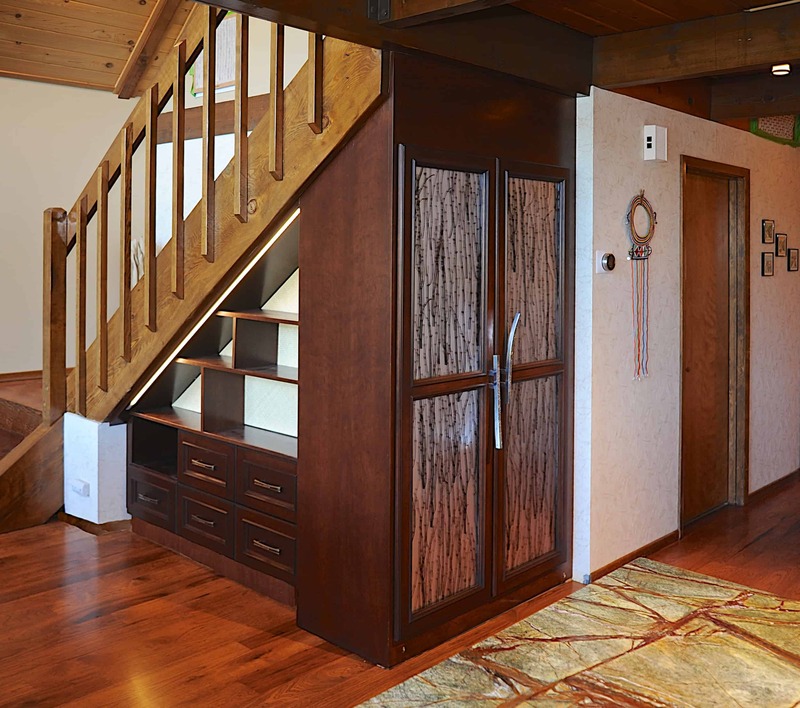 Above: Under stairs storage keeps clutter from getting... under foot. Marie Kondo has become something of a cultural phenomenon with her mantra, “Tidy your space, transform your life.” While obtaining spiritual enlightenment may require a few steps beyond decluttering your home—when it comes to living in a more beautiful and functional home, it’s a great place to start. 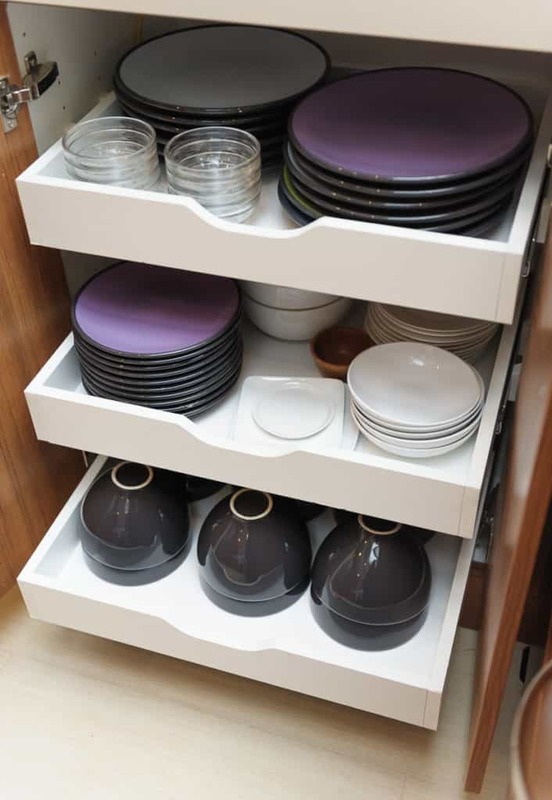 Above: Cabinet pull outs maximize storage space and help access hard-to-reach areas. Are you looking to simplify your living space? Do ever feel overwhelmed by clutter? 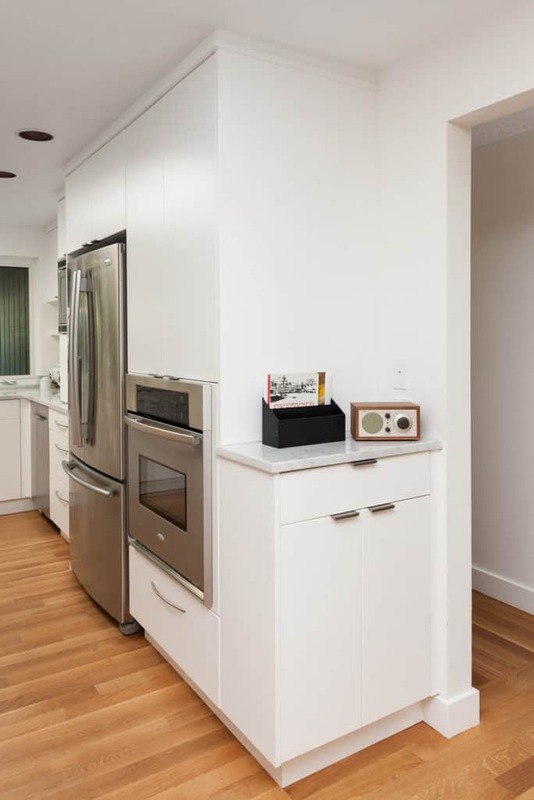 Whether you are living in a small space—or want to declutter a larger one—you may be experiencing some storage challenges. Here are a few design ideas that can help you keep your clutter under control. Above: Endcaps are a great place to add storage, charge devices, or corral loose items like car keys. This is typically where old lazy Susan’s are placed in a kitchen. Make a dedicated space for phone and electronics charging, mail, keys, etc. This is often built into the end cap of the kitchen. Take advantage of height rather than just square footage. This is often a challenge, particularly in bathrooms because of the sink drain. Keep your countertops clear. This can often be accomplished by adding cabinets in awkward corners. One method you might consider is to create an “Outbox” for high-clutter rooms—think family rooms, children’s rooms, and home offices. Make a habit of adding unused items (or toys) to the Outbox whenever you use the room. Then, each month, donate or gift items from the Outbox. If you’re in a book club, this is also a great way to “recycle” your favorite reads. The Outbox itself can be decorated in a way that suits the room and inspires people to use it. And consider enlisting your children’s help and invite them to select one item each month to add to the box. Are you interested in learning how smart design (and clever storage solutions) can help declutter YOUR space? Our team is here to help. We believe that (storage) enlightenment often comes in tidy spaces, thoughtful design, and creative solutions.